It is not surprising that during World War I a design for a prefabricated, portable multi-purpose hut was developed. Given the explosive devastation of ‘modern’ warfare, the need for such a building would have been overwhelming. 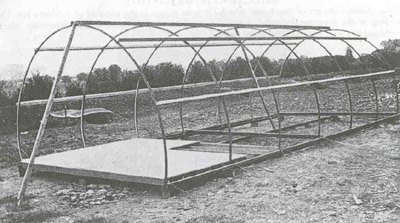 In Spring 1916, Major Peter Norman Nissen of the 29th Company Royal Engineers began to experiment with prefabricated hut design. Nissen, a middle aged mining engineer (and sometime inventor), constructed just three prototype semi-cylindrical huts. Nissen’s designs were subject to intensive design review by his fellow officers, Lieutenant Colonels Shelly, Sewell and McDonald, and General Clive Gerard Liddell, which helped Nissen modify and enhance the design. 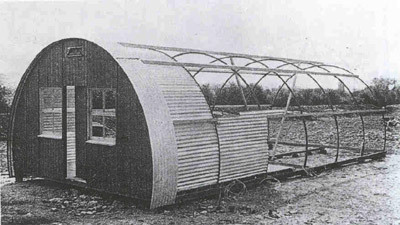 After the third prototype was completed, the design was formalized and the Nissen Hut was put into production in August 1916. At least 100,000 were produced in World War I.
Nissen patented his invention in the UK in 1916 and patents were taken out later in the United States, Canada, South Africa and Australia. 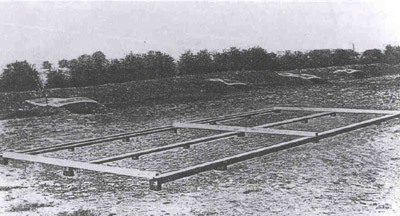 Nissen received royalties from the British government, not for huts made during the war, but for their sale after the conflict. Nissen got £13,000 for the development work and the DSO (Distinguished Service Order) medal. 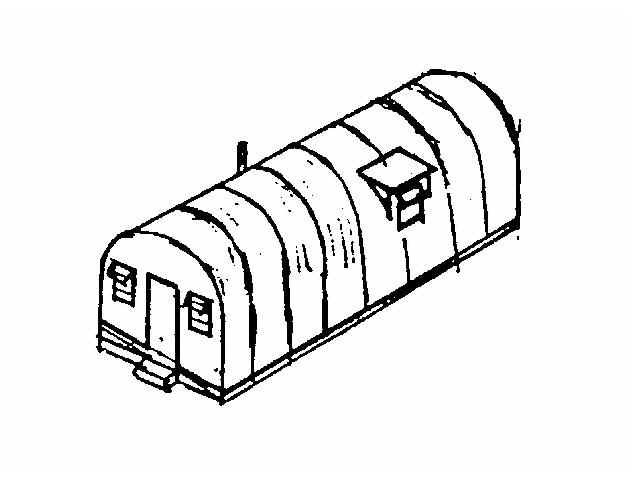 Two factors influenced the design of the hut. First, the building had to be economical in its use of materials, especially considering wartime shortages of building material. Second, the building had to be portable. This was particularly important in view of the wartime shortages of shipping space. This led to a simple form that was prefabricated for ease of erection and removal. 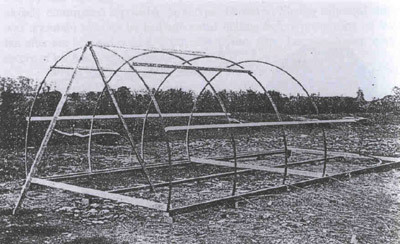 The Nissen hut could be packed in a standard Army 3-tonne truck/wagon and erected by six men in four hours. The world record for erection was 1 hour 27 minutes. It is made out of corrugated iron with a metal frame, it also has a wooden door and a few oiled cloth widows, instead of glass. Stage 1. Wooden bearers are laid on level ground. Stage 2. Steel ribs are bolted to the bearers, and wooden purlins fixed to the ribs with hook-bolts. Stage 3. Wooden joists are screwed to the bearers. These joists support the wooden floor panels. Stage 4. 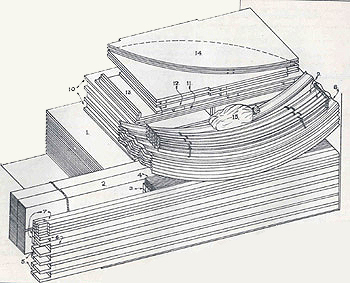 The inner lining of light corrugations, is fixed behind the ‘T’of each rib. The outside sheets, with vertical corrugations, are then fixed over the inner lining. The ends of the hut are covered with vertical boarding with battens over the joints. Nick – a post worth of Diamond Geezer! Brilliant.